Most people in the United States know John Peter “Honus” Wagner as the player whose name and image appeared on the legendary T-206 tobacco card, the most valuable baseball card ever printed. Historians of the game also consider Wagner to be perhaps the best shortstop of all time. Born in Carnegie, Pennsylvania, in 1874, Wagner lived almost his entire life in that town. His former house at 605 Beechwood Avenue in Carnegie still stands as a private residence, looking much like it did when Wagner lived there. 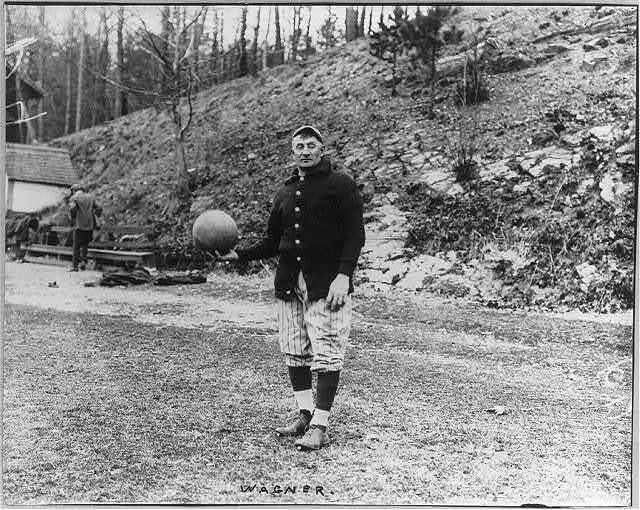 The house was built for Wagner in 1917, his last year as a player, and he lived there until his death in 1955. The house is a two-and-a-half story, tan-brick foursquare, with a central dormer and a front porch with matching tan-brick columns. Four grey-painted concrete steps lead from the sidewalk to a clay-tiled front porch. An ornate wood front door with leaded glass panels on either side of the door and in the transom above. To the left of the entrance is the house number “605″ set inside a shield carved in granite, and to the right, a similar granite shield with the initials “JW” framing the doorbell. Just a ten mile drive from old Forbes Field and seven miles from PNC Park, the current home of the Pirates, Wagner’s house on Beechwood Avenue is a well-preseved time capsule and well worth the stop.